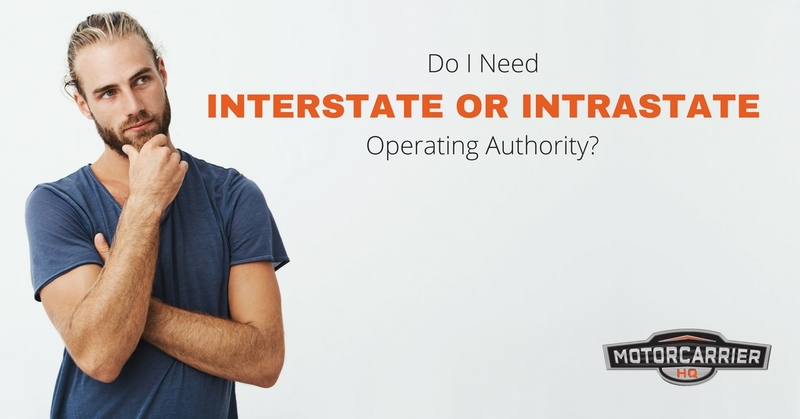 Do I Need Interstate or Intrastate Operating Authority? Are you looking to start your own trucking company? Have you decided where you want to haul? What you want to haul? How you’re getting the truck you need to haul? Before you even start hauling your first load, you’ll need to get proper licensing and registration. The question is, where do you even start? Here is just one piece of the big puzzle that is trucking regulations: Interstate vs. Intrastate Operating Authority. Determine if your company is working for-hire. This means that if you are planning on hauling someone else’s property for a profit, then your company is considered for-hire. This is different than working in-house, where you or the company you work for is hauling their own property. Interstate means crossing state or national borders, so if you are planning on going through more than one state or country to deliver your loads, then you’ll most likely need your Interstate Operating Authority. Even if your company is running under these two criteria, there are still exceptions that may or may not require you to get your Interstate Operating Authority. Give us a call at (866) 739-2032 to find out if you really need it. Some trucking companies choose to run only in one state. If you choose to go that route, you’ll probably need Intrastate Operating Authority, which is different than Interstate Authority. Companies working intrastate still need proper registration, whether it’s in the form of a USDOT number or simply just with Intrastate Operating Authority. While there are companies that can make a profit while only running intrastate (only in one state), you could be missing out on profitable opportunities with large loads that go through multiple states. How are These Different Than a USDOT Number? If your trucking company is doing what a trucking company does best (transporting loads for a profit), you’ll most likely need a USDOT number. This distinction is important because even if you are driving what may be considered a commercial vehicle, if you are using it for personal use, you probably do not need one. If you’re only planning on intrastate commerce, some states don’t require you to get a USDOT number, while others do. Here is a list of states that need a USDOT number even if the company is only working in one state. How do I get my Interstate Operating Authority? To get your Interstate Operating Authority, you’ll first need to get your USDOT number. Before, your Interstate Operating Authority was tied to a Motor Carrier (MC) number. However, regulations have changed. Now, your Interstate Operating Authority is registration you need to to run your business interstate. It’s independent from your USDOT number, but the registration is tied to it. Motor Carrier can help you get your USDOT number and your Interstate Operating Authority. If you’re not confused yet with the Interstate or Intrastate operating authority and USDOT number, there are still a few more steps you need to take to get the proper motor carrier authority to get your trucking company off the ground and on the road. After you’ve legally registered your company as a business, whether it’s an LLC, corporation, or other organization, it may be time for you to pay the $300 FMCSA Filing Fee. This fee is the first step to getting your proper motor carrier authority. Only a processing agent can file the Form BOC-3. To make things easier for you, Motor Carrier HQ can take care of the BOC-3 Filing for free as part of our motor carrier authority package. If you’re trying to start your own trucking company, you don’t have to do it alone. We know that you could do most of the paperwork yourself, but we can save you time and money. If you’re thinking about running your own business, give us a call. We work directly with you to make a customized game-plan that works best for your new company.